Now I am not going to lie, I have been hit and miss on my what “I learn from cooking” posts that everyone seems to like. I have been mostly recipe and less learning. As I go through the process of selling the house and getting packed I am taking it easier on the story telling, and just looking at cooking the food left in my house and garden. I will keep the recipes the high caliber that I love, but it will be what I have left. Like all my other recipes you will get my ideas and thoughts as I make it, so I hope you do not mind the rambling nature of my posts. The rambling does serve a purpose. It helps those that are trying it for the first time as I discuss things I like to add and things I have tried. Fish and chips are classic meal and rather easy to do really. I discovered I liked this oddly enough while trying to figure out what to do with a white fish I had been given by family. I struggled, because I love to cook salmon and fry trout, but had no idea how to prepare the white meat in a way I might find tasty. 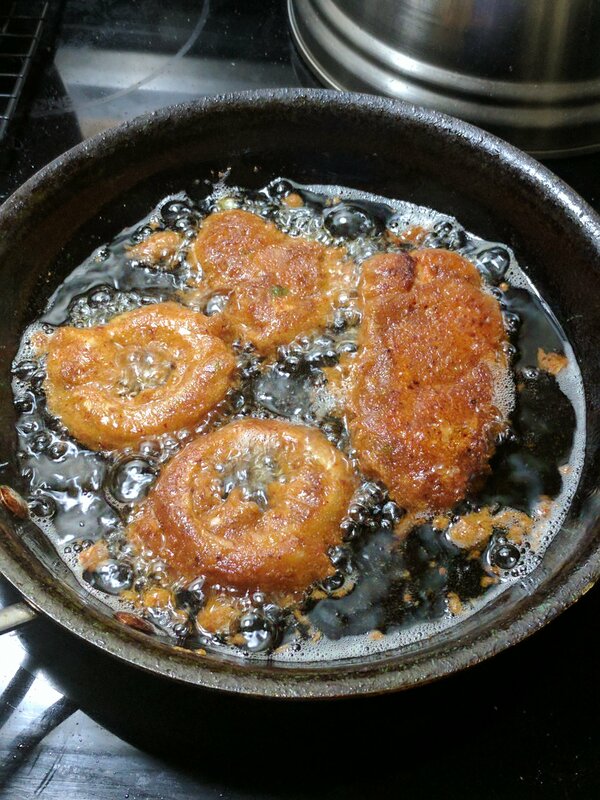 I was assured that beer batter and fried was the best, so I worked to make sure I could find the best way. Luckily this recipe was so good, I now work to keep at it and love to make it. Like bread and Hawai’ian Poke this recipe looks hard if you only see the finished product, but is really very easy. Any idiot can just dive in and give it a try. I suggest if you like to order it at your local pub, you try it at home. I also suggest you find a nice brewery in town and get a growler for the recipe and to drink alongside it. Sometimes I use the same beer, and other times I try different beers that I think will go good together. 1 Table Spoon Seasoning per potato (I like paprika or berbere but any seasoning you like will work. Crushed pepper has been a recent favorite of mine.) For those that are not sure go with a paprika, easy to find and light on the senses. I used the same spices I had left over from kimchi. Some people like salt, I do not add it, but when I have I do about ½ a teaspoon. Preheat oven to 425 degrees F. You will want your rack in the upper third of the oven. Wash the sweet potatoes and cut lengthwise with your own desired thickness. I prefer mine a little bit thin if I am going to eat them plain and a little thicker if I am going to make a nice dipping sauce. Put the slices into a large bowl with the other ingredients and toss it all together. Save out about half of the garlic and other fresh ingredients. I normally have to get my hands dirty and really rub it all together to make sure the potatoes get a nice coating and seasoning. 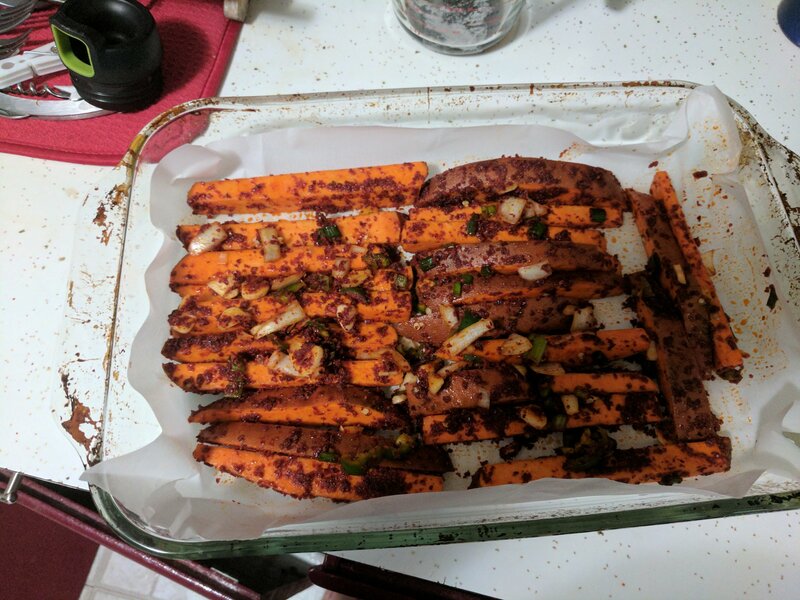 Layer a baking sheet with the fries. If the fries are well oiled or it is a nonstick sheet you may not need non-stick spray. I never use the spray, but I have these silicon sheet liners. I am not sure, but it all seems to work out. I have also used Parchment paper in the past with good results. You know me I am all about ideas. Most of what I read says to bake these puppies for about 20-25 minutes. But honestly, I start to check at 20 that they are soft and if not, I add another 5, and then another 5, and then another 5. Remember to turn them at least once. Most recipes say multiple times, but I figure it is a tossup between letting out the heat and getting them turned. About five minutes before they are done (or if you broil them like I do, right before broiling them) add the rest of the garlic on top. This will make sure there is still some semi fresh garlic on the fries. I also like some raw later, for on top. But I love garlic…. So… Do what you want my friend. Once they are done baking (soft on the inside a little dry on the outside) they are ready to eat, but I like mine crispy. So, I do one last flip of all the fries and put them under the broiler for 2-5 minutes to get them nice and crispy. Watch them though as this is the point I have burned them on more than one occasion. When done throw them on the plate and finish up your fish. The nice thing about doing the fries early is that crispy fries are great. So, you are free to put them on the middle rack, turn the oven down to like 200 degrees F and keep them warm. If you do, do this, cover them with tinfoil or something. 1 ½ cups beer. I enjoy a brown for the nutty flavor, but I have also tried Daft Badger’s Blood Orange with good results (their Wendigo is the best, but they discontinued it). At the end of the day pick a beer you think will go good with whatever you are battering. Supposedly lighter is better, but my tastes are my own. 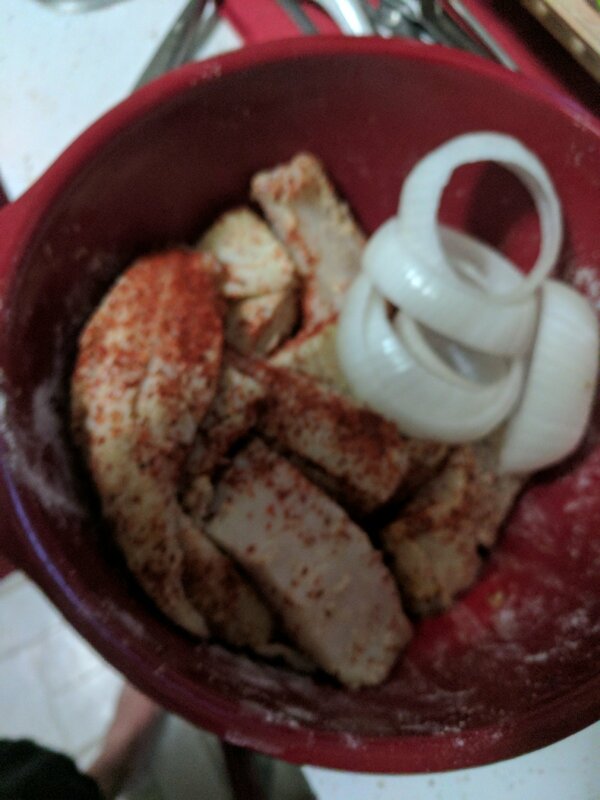 Mix all the dry ingredients and garlic together until fine. Fold the egg into the mixture with a nice smooth beating. Stir in the beer and call it good. Should take you about 5 minutes tops once you have all the ingredients ready. It should be thick enough to coat your finger. If not, add a little bit of flour at a time until it does. If you add too much flour throw in another beaten egg. This batter can be used to make onion rings, chicken strips, calamari, or as we will today beer battered fish. Whatever you dip into the mixture it will help it stick better if you get a little flour on before dipping into the batter. 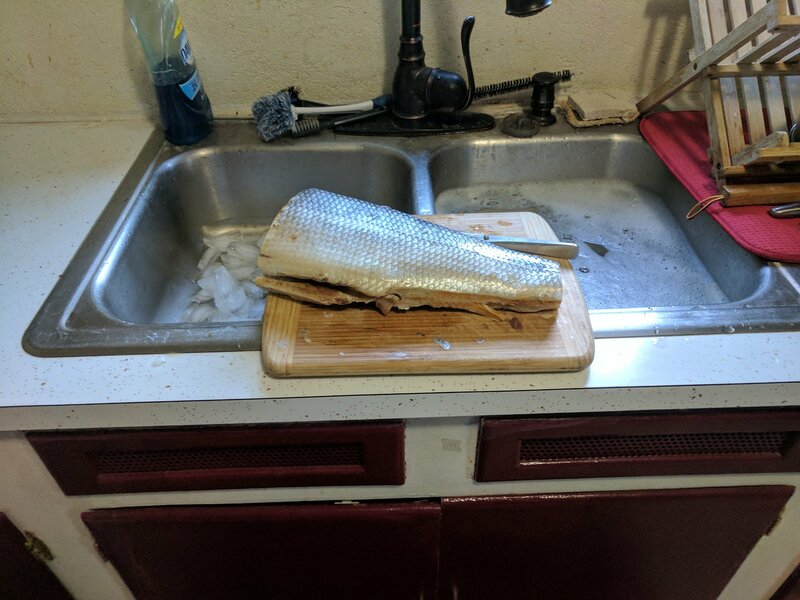 Fish as much as you want 😊 A nice white fish, Cod or Halibut are the most common I am using shiifish which you likely will not get if you are not in Kotzebue, Alaska. Most fish will do though and white fish are preferred (not white tuna in the US, you will get Escolar, and that is nasty). Cut the fish into bite sized or strip sized pieces. I like the strip sizes like you find in restaurants. Heat the oil to medium high heat (375 degrees F to be exact). Just like when we made fry bread the amount of oil, temp, and time in oil will vary, but I am giving some good rules of thumb. Take the fish chunks toss them in the flour. After they are nicely coated (doesn’t have to be fully covered, a lot of people do not even coat the fish in this first coat). In the above picture I tossed the fish in seasoning and flour. Dip them in the beer batter. I like to use tongs here to help keep my fingers clean and the mixture fully around the fish. Slide the coated fish piece into the hot oil carefully. Turn as needed to keep from burning. The fish will be done when it turns a golden brown. Cook in batches to not overload your pan, and also to help keep the oil at temp as everything cooks. Serve next to the Sweet potato fries and a wedge of lemon. 2 Tablespoon per potato + ½ tablespoon of Seasoning, I like red ground pepper flakes (you can get 2 TB of one and ½ of another. Read the recipe). If you are not sure go with Paprika. Hope you like the recipe, try it for dinner. Let me know in the comments what spices/seasonings you like and which you do not. Try a favorite beer in the batter throw it out there. I love a good brown ale, but I am always interested in new flavors. And remember that this dish is great to read over a good book like mine 🙂 And reviews of the book are always welcome.